According to several sources, including emilypost.com , brides this year can expect to see weddings that reflect these changes and influences. Personalized Weddings continue to be important to couples who are looking to include elements that have personal meaning to the couple. Ceremonies and receptions can reflect multi –cultural and/or inter-faith statements. Monograms remain important and reflect the couple’s first names. The Internet continues to play an important role in wedding planning. High tech access is used in vendor selection, gift registries, information sharing, guest information sources and communication with members of the wedding party. Note: Emailing invitations and thank you notes is still not considered correct or classy. The importance of color continues in bridal apparel. While white and ivory remain favorites, wedding gowns are showing color touches, shoes are colorful (with blue the odds on favorite) and floral decorations carry the color theme throughout the wedding plans. The role of grooms in wedding planning continues to grow. There are more and more joint decisions being made by the couple (who tend to be older and funding their own weddings). While the formal structured wording of the wedding invitation is still customary, more couples are choosing to individualize their invitations with colorful papers, ribbon trims and unique wording. It is important to note that even if the format of the invitation is unique, it should still contain all the information guests need plus be grammatically correct. Brides need to remember that no mention of gifts, even “no gifts, please” is ever made on a wedding invitation. It is acceptable to mention a website on an enclosure card and that website can contain information about gift registry options. The phrase “black tie” may appear on the reception invitation, but is not printed on a wedding invitation. Even if your wedding budget is smaller than you would like, there are ways to create an elegant event. Our expertise is helping brides have the wedding of their dreams. We work with a bride to really understand the impact and image that a bride dreams of for her wedding. We help the couple establish a budget and work with them to live within that budget as the wedding is planned. Determine what you can pay and then stick to it. Tap personal resources. Are any friends photographers? Does the couple have unused frequent flyer miles? Are any friends caterers or do they own a large home with a yard that could host a wedding event? Think outside the box. Plan a wedding for a Sunday afternoon or other unusual time. Don’t select prime time for your wedding. Plan an afternoon cocktail reception instead of a sit down dinner. Get married in the morning and plan a buffet brunch for the reception. Look at unusual places, times and options that can save money but still offer an elegant environment. Remember that it’s your wedding, not an entry in the social calendar. If you are visualizing your wedding as a way to impress people, you are sure to overspend. Instead, think of your wedding as a way to celebrate your new life with someone. Keep it personal not fodder for the evening news. Reconsider décor items. Repurpose bridal and bridesmaids bouquets as table centerpieces, skip the aisle runner, keep your invitation simple, choose in season flowers, fill space with rental greens and choose a signature cocktail instead of an open bar. Consider the impact of texture. It tends to imply luxury more than a glossy or flat finish. Incorporate texture in the invitation paper, in table cloths, in napkins, menus, place cards, programs. White Tie – refers to full evening dress. Traditionally it is a tux with tails, a top hat, an overcoat, a cane and of course, a white bow tie. (Think Fred Astair) If the wedding party is in full formal attire, it is usual to suggest that male guests appear in tuxedos or at least dark suits. Black Tie Optional (or Preferred) – This specific dress code extends the option of wearing either a suit or a tuxedo. If this is extended to guests, then it needs to apply to the groom as well. Generally, the groom and members of his wedding party will choose a tuxedo (with your encouragement) but classic suits in dark shades like black, deep navy or brown are also considered appropriate. Daytime Wedding (in warm weather) – This dress code implies a level of informality (think Sunday brunch) and allows for linen or twill suits. If the wedding is at a beach or informal outdoor site, men can skip a tie and wear a simple blazer with dress pants. 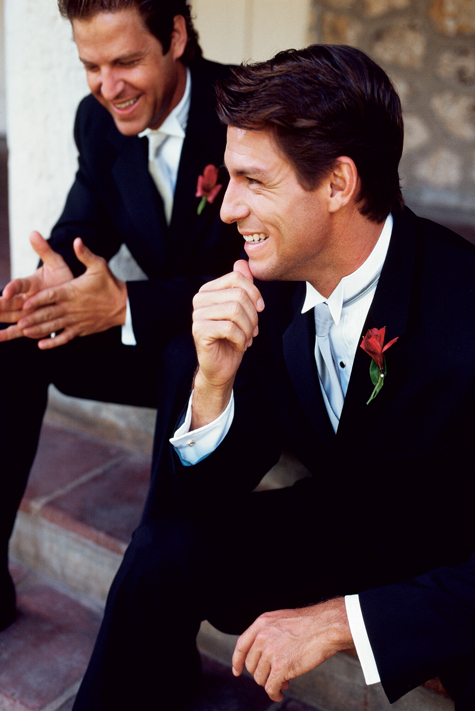 Daytime Wedding (in cold weather) – This dress code usually suggests that men go with either a cotton or wool suit in the fall and winter seasons. Preferred colors are dark – navy or black.